If the company can't expand its product line beyond Hero cameras, it'll be tough to make any sort of real comeback. From time to time, it seems like GoPro (NASDAQ:GPRO) is on the cusp of escaping its current rut without ever quite breaking out. New products spur excitement every once in a while, and earnings seem to bounce between optimistic and disappointing. At the end of the day, GoPro needs a lot to go right to see a long-term recovery. Given the current trajectory of its product lineup, it's unlikely we'll see a big improvement in key metrics anytime soon. To turn around net losses, GoPro needs to increase total gross profit from core products, which needs to cover operating costs and other expenses. The company can do this by increasing sales volume, raising prices, and/or cutting unit costs. None of these initiatives seem to be going particularly well right now. We've learned in the past few years that unit sales aren't increasing -- they're actually falling. Unit sales peaked in 2015 at 6.6 million and fell to 4.3 million in 2017. Volumes have leveled off recently and may be growing ever so slightly with shipments up 1.7% in the first half of 2018 to 1.82 million units, but investors have little to pin their hope to at the moment. On the pricing front, GoPro has backed down from premium pricing, choosing to go with a "good, better, best model" with price points of $199, $299, and $399. Incidentally, that's the same price point GoPro's lineup had in 2012. Clearly, there's little to no wiggle room for the company to raise prices. 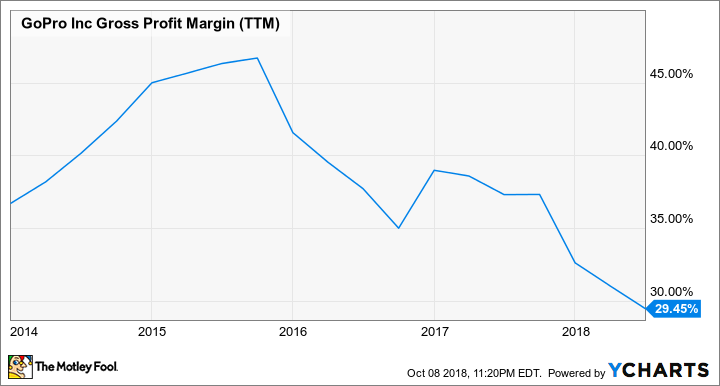 As for costs, GoPro hasn't shown significant progress on increasing margins in three years, which tells me it isn't having much success in cutting production costs. The chart below tells investors everything they need to know about sale prices and unit cost trends. GoPro's management expects gross margin to improve in 2018, peaking at around 40% in the key fourth quarter, but full-year gross margin will be in the mid-30s, which is still well below highs in 2015. Margins are getting better, but remember that volume is down significantly as well, so total gross profit will be down. That's ultimately what covers operating costs and drives profitability. Given the expected operating expenses of about $400 million this year, a 35% gross margin would require $1.15 billion in sales to break even, which is exactly what GoPro has generated in the past year. That's barely breakeven, and GAAP net profits are at least a few years away. Another way GoPro could improve profits is by growing into new markets by expanding its product portfolio. But when it's tried to do that, it's failed. The Karma drone was a flop and has been discontinued from the lineup. The spherical camera Fusion is a market leader but has a very small addressable market until virtual reality headset sales grow. It's not likely GoPro will be expanding into more adjacent markets in the next year, particularly now that we've passed the key holiday launch cycle. Not having new products will make it tough to recover financially and will put more pressure on the core Hero 7 lineup. GoPro has become a one-trick pony with a successful action camera and little else to hang its hat on. But the Hero lineup seems to be in a structural decline, and GoPro hasn't been able to find a growth product to replace it with. Recovery is an uphill battle, and investors should adjust their expectations to reflect the challenges ahead.